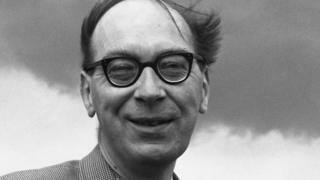 Philip Larkin is to be honoured with a memorial in Poets' Corner in Westminster Abbey. A floor stone dedicated to Larkin - who died in 1985 - will join the names of the country's best-loved poets including WH Auden, TS Eliot and William Wordsworth. It will be unveiled on 2 December 2016, the 31st anniversary of Larkin's death. The last poet to be honoured was Ted Hughes in 2011. With poems like The Whitsun Weddings and This Be The Verse - which contains his famous musings on "your mum and dad" - Larkin is widely regarded as one of Britain's finest 20th Century poets. The decision to honour him was made by the Dean of Westminster, the Very Rev Dr John Hall. "Philip Larkin is one of the great poets of the 20th Century in English and it's been pressed on me by a number of his colleagues and friends that it's the right time to memorialise him," Dr Hall told the BBC. Born in Coventry in 1922, Larkin studied at Oxford and had his first poems published in 1940. He took up the position of librarian at the University of Hull in 1955 and, in the same year, published his acclaimed collection The Less Deceived. His last collection High Windows was published in 1974. In December 1984, a year before his death from cancer, he was offered the chance to succeed Sir John Betjeman as Poet Laureate but declined, being unwilling to accept the post's high public profile. The posthumous publication of Larkin's letters gave an often unflattering insight into his inner life and led to accusations of racism and misogyny. Despite the dent to his reputation, in 2003 Larkin was chosen as the nation's best-loved poet of the last 50 years, in a survey by the Poetry Book Society. Poets' Corner became established at Westminster Abbey after Geoffrey Chaucer's remains were interred in a tomb there in 1556.